My latest blog post and instagram were full of feminine side of me. Just made a quick post wearing this vintage shirt. I love the collar and those oldie color goes on my picture. 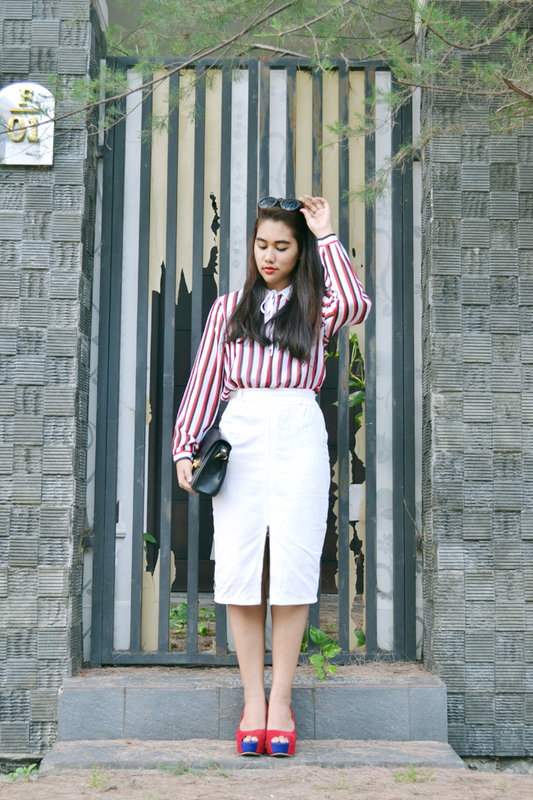 Speak of the devil, the slit skirt is back on my outfit post, found this cute skirt inside treasure box (re:mama's wardrobe). H-9 of my graduation day, I can't wait for my very big day of my life as a college student of course, I'm gonna fly away to another step of life. Future awaits. Or future can't wait? Seriously, I still can't leave my comfort zone, not lazy zone, I mean I love my blogging time but in the same time I can't live based on blog life, I live in the real life. I need to go to work, I need new experience as a worker for the first time, and this decision will lead you to your next chapter of your life. Hey my newest article on WhatWeLike.co is out, read them here and here.